Press Release From: World View Enterprises, Inc.
World View launched the flight out of Benson Municipal Airport at 6:05am PT on Saturday, September 3rd, 2016. The World View launch operations team, led by Launch Director and Chief Engineer Sebastian Padilla, coordinated with all local, regional, national and government authorities to ensure a safe and seamless mission operation. The flight reached a peak altitude of just over 103,000ft., with total flight duration lasting just over five hours. 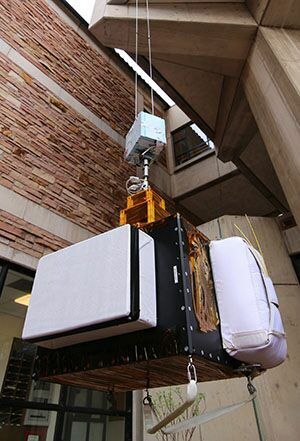 The payload and balloon were both safely returned to earth following the flight, and were recovered by World View personnel. World View’s innovative flight technologies offer a unique perspective of Earth from the edge of space. World View delivers meaningful insights to enterprises, agencies, and individuals via two primary business segments: Stratollite un-crewed flight systems and Voyager human spaceflight systems. Stratollites, in operation today, offer low-cost, long-duration, persistent high-altitude flight for enterprise and government agencies. Using advanced stratospheric balloon technology, Stratollite applications include communications, remote sensing, weather, and research. The Voyager human spaceflight experience is under development and will launch in the near future, offering private citizens a comfortable, safe, and perspective-changing voyage to the edge of space via high-altitude balloon. To learn more about World View, visit www.WorldView.space .